East Fife slipped out of the top four. East Fife slipped out of the top four for the first time in a long time. For some months the side has been perched nicely inside the play-off zone but, over the past couple of months, results have seen their lead eroded. 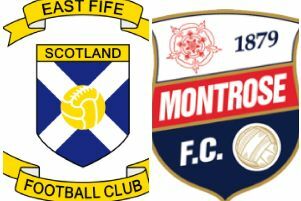 One of the clubs eating into the advantage was Montrose, and they arrived in Methil knowing a win would see them leapfrog their hosts. By all accounts Mo weren't look at things like that, and instead had one eye on those behind them, more concerned about preserving their League One status for another season. Last season's League Two winners were hardly likely to be dragged into the battle at the basement, but credit to them for keeping their eye firmly on their own objective and not being distracted by promotion talk. The pressure on Mo has been to survive, and with each passing weekend that pressure has lessened as they racked up win after win. But what East Fife would have done for even a couple of those wins. Brechin, Stenhousemuir and Montrose are all amongst the clubs who have taken points off the Fifers in recent weeks. Performances haven't been bad, in fact some of the play has been pretty decent, but the side just hasn't been getting the results. Now it means that things aren't in their own hands anymore. There are three games to go and, quite simply, East Fife can't afford any slip ups. They need the full nine points and have to hope that Montrose drop something along the way. It could have been all so different if they had beaten Stewart Petrie's side on Saturday. The game was short on real, clear cut chances. Mo created no more than the Fifers, but took the chances that came along. Ross Davidson and Kevin Smith tried their luck for East Fife in the first half, but it was in the second that things came to life. The strong wind, whipping towards the Leven end, gave Iain Campbell's deliveries an extra menace and the home side had to scramble a couple clear. But from another, a free-kick near to the corner flag, they wouldn't survive again, and Paul Watson popped up to help the ball on its way into the net. In the dying seconds Watson added number two. Home boss Young said: “Overall we never started in the first half but then came into it a bit. “It wasn’t good enough and a lot of guys had too many off days. “They can go back and assess things for themselves on the video because I will, that’s for sure.